Stunning handmade glass table clock. 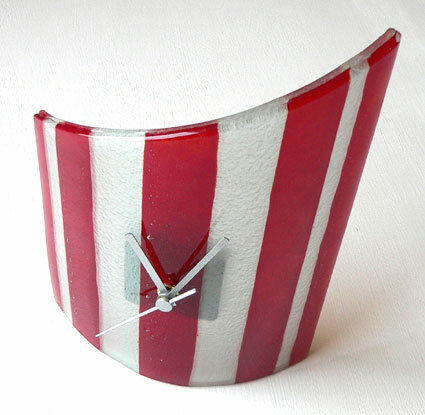 Totally awesome design cherry red fusion glass stripes set in-between frosted white fusion glass stripes. Contemporary curved, abstract design allowing you to set on a table, though can be wall mounted if you use a long screw (not supplied). Height ranges from 26-17cm and it is 19cm wide. This clock is handmade and to a high design quality, sure to draw comments from everyone who sees it!